The USB-I2C module provides a complete interface between your PC and the I2C bus. The USB-I2C module uses the FTDI FT232R USB chip to handle all the USB protocols. The documentation provided by FTDI is very complete, and is not duplicated here. Before using the USB-I2C, you will need to install FTDI's Virtual COM Port ( VCP ) Drivers. These drivers appear to the system as an extra Com Port ( in addition to any existing hardware Com Ports ). Application software accesses the USB device in the same way as it would access a standard Windows Com Port using the Windows VCOMM API calls or by using a Com Port Library. Drivers are available for Windows, Apple, Linux and Open BSD systems directly from the FTDI website. You should get and install the drivers now, before you connect the USB-I2C to your computer. The Drivers page is here. After installing the drivers, and plugging in the USB-I2C module to a spare USB port, you will want to know which COM port it has been assigned to. This will vary from system to system depending on how many COM ports you currently have installed. To find out where it is, right click on your "My Computer" desktop icon and select the "Device Manager" tab. Now scroll down and open the "Ports (COM & LPT)" tab. You should see the USB serial port listed - COM2 in the example below. If you want to change the COM port number - just right click on it, select properties, select advanced and select the COM port number from the available list. The COM port should be set up for 19200 baud, 8 data bits, no parity and two stop bits. The diagram below shows the I2C connections. The 0v Gnd pin must be connected to the 0v (Ground) on your I2C device. The Input 1 pin is actually the processor reset line and is used in our workshop to program the processor after final assembly. The reset function has been disabled in software so that this pin may be used as an input pin. It has a 47k pull-up resistor on the PCB, so if the input is not required you can just ignore it. These pins are the I2C bus connections. They should be connected directly to the SCL and SDA pins on your I2C device. 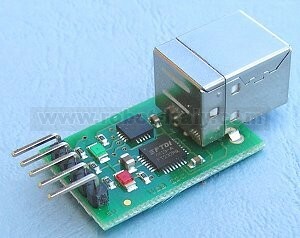 The USB-I2C module is always a bus master, and is fitted with 4.7k pull-up resistors on the PCB. The +5v supply from the USB-I2C module can supply up to 70mA to external devices. If your I2C device requires more than this, or has its own supply, then leave the +5v pin unconnected. Do not apply your own 5v supply to this pin. I2CD_CMD (0x53) - This allows you to read or write to I2C devices that do not have internally addressable registers, such as the Philips PCF8574 I/O expander. I2C_CMD (0x55) - This allows you to read or write to internally registered devices such as EEPROM's or our own range of modules. USB-I2C_CMD (0x5A) - A range of commands to the USB-I2C module, generally to improve selected communications. These include devices such as the Philips PCF8574 I/O expander. Following the I2CD_CMD you send the devices I2C address and the data byte. This 3 byte sequence sets all bits of a PCF8574 I/O expander chip low. All 3 bytes should be sent to the USB-I2C in one sequence. A gap will result in the USB-I2C re-starting its internal command synchronization loop and ignoring the message. After all bytes have been received the USB-I2C performs the IC2 write operation out to the PCF8574 and sends a single byte back to the PC. This returned byte will be 0x00 (zero) if the write command failed and non-zero if the write succeeded. The PC should wait for this byte to be returned (timing out after 500mS) before proceeding with the next transaction. The USB-I2C will perform the read operation on the I2C bus and send a single byte (the PCF8574 inputs) back to the PC. The PC should wait for the byte to be returned (timing out after 500mS) before proceeding with the next transaction. This includes almost all I2C devices. Following the I2C_CMD you send the device I2C address, then the devices internal register address you want to write to and the number of bytes you're writing. The maximum number of data bytes should not exceed 60 so as not to overflow the USB-I2C's internal buffer. This 5 byte sequence starts an SRF08 at address 0xE0 ranging. All 5 bytes should be sent to the USB-I2C in one sequence. A gap will result in the USB-I2C re-starting its internal command synchronization loop and ignoring the message. After all bytes have been received the USB-I2C performs the IC2 write operation out to the SRF08 and sends a single byte back to the PC. This returned byte will be 0x00 (zero) if the write command failed and non-zero if the write succeeded. The PC should wait for this byte to be returned (timing out after 500mS) before proceeding with the next transaction. Again the USB-I2C will respond with non-zero if the write succeeded and zero if it failed. A failure means that no acknowledge was received from the I2C device. The USB-I2C will perform the read operation on the I2C bus and send two bytes back to the PC - high byte first. The PC should wait for both bytes to be returned (timing out after 500mS) before proceeding with the next transaction. REVISION is used to read the USB-I2C firmware revision. It returns a single byte indicating the revision number. The two data bytes are unused and can be anything, but they must be sent. NEW_ADDRESS command is used to change an SRF08's I2C address to a different address. The new address should be in the first of the two data bytes. The second data byte is unused and can be anything, but it must be sent. Changing the address on the SRF08 requires 4 separate transactions on the I2C bus. The USB-I2C know how to change an SRF08's I2C address and just needs you to send it the new address using this command. When using it, make sure you only have one SRF08 connected, otherwise you will set every SRF08 on the bus to the same address. The single return byte is the new address sent back when the task is complete. UNUSED Unused - for CM02 compatibility only - returns 0x00. SCAN This command is provided for CM02 compatibility. It assumes you have an MD22 motor controller, a CMPS03 compass module and a number of SRF08 rangefinders. SCAN1 assumes 1 SRF08, SCAN8 assumes 8 SRF08's. The two data bytes contain the Left and Right motor speed values for the MD22 motor controller. After sending the new motor speeds to the MD22, the USB-I2C will send a return frame comprising the battery voltage (0x00 - see above). This is followed by two bytes of compass bearing - high byte first, and then three bytes for each SRF08. The first of the three bytes is the SRF08's light sensor reading. The next two bytes is the range - high byte first. SRF08 data is always returned starting with address 0xE0, 0xE2, 0xE4 - going up one address at a time until all requested SRF08's data has been sent. After sending the data back up to the PC, the USB-I2C automatically issues a new ranging command to all SRF08s. The ranging command used is 82 (0x52) which returns the results in uS. To convert to cm divide by 58 and to convert to inches divide by 148. SRF08 addresses should have been set up before running this command and the MD22 should be initialized to the mode and acceleration required. One more important feature. The SCAN command also sets up a 500mS timer on the USB-I2C. If another SCAN command is not received within this time, a command is automatically sent to the MD22 to stop the motors. This is to prevent your robot wandering out of control if it ventures outside of the range of the radio link. There are two status Leds on the USB-I2C. A red Led indicates power is on and the green Led flashes briefly when a command is received. The red Led can be turned on and off using the SETPINS command. See below. The USB-I2C module can also convert the analogue values on pins I/O2 and I/O3. Before doing this the I/O pins should be set high, effectively making them inputs. Remember though that this is primarily a USB to I2C interface and as such has 4k7 pull-up resistors. Take this into account when connecting your analogue input. Note - you cannot mix I/O mode and I2C mode, I/O commands should not be used when I2C devices are connected. To help you test and get the USB-I2C up and running quickly, we have provided a couple of simple test programs. The first is for the USB-I2C connected to an SRF08 ultrasonic ranger. The connector on the USB-I2C module may be soldered directly to the SRF08 as shown, or you can use a cable if preferred. 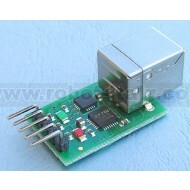 The USB-I2C module can easily supply the 25mA peak of the SRF08. The software automatically searches for the SRF08 and displays its I2C address, along with revision number, range and light sensor reading. You can download usb_i2c_srf08.exe and the C source code here. The second is for testing I/O modes, and allows you to set/clr the I/O's as well as read the digital and analogue inputs. You can download usb_i2c_io.exe and the C source code here.